Cafe table base in a choice of Chrome, Aluminium or Silver suitable for use with table tops up to 600mm round or square. The chrome version is available from stock for a 5 - 7 day lead time. Here at Café Reality we offer a wide range of restaurant tables, making sure that we have something to suit every eventuality. 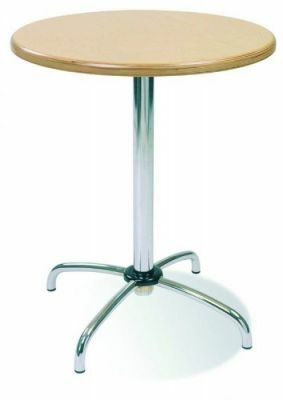 Bistro tables come in different shapes, colours and sizes and can be customised to suit your taste. Catering tables need to be tough and hardwearing as they are going to be subject to many banquets. Be sure to check out our extensive range of cafe tables and chairs and our customer service advisors are on hand to help with any questions or queries that may arise. Catering tables and cafe tables can be used for a number of things; they can be decorated and covered for banquets and meetings or simply be part of a buffet lunch or dinner. They are ideal for all sorts of events and when they are easily stacked they need less space for storage. They can be brought out of storage quickly and put to use. Being made of hardwearing materials means they can be wiped after spillage or wiped down after each use; they are designed to cope with a heavy traffic of customers or diners and are perfect for large parties. We offer an excellent design service with no commitment; you can receive a detailed quotation and visual plans. This is a free service and may help you to decide on your layout and purchases, or to make the most of the space you have. Restaurant tables can be featured on these visual plans along with counters, chairs and any other items. From large counter areas to small cafe tables we really can help with it all. When choosing catering tables or bistro tables you must make sure that the measurements are correct; there needs to be enough space from the table to the chair so that the diner can be seated as comfortable as possible. Bistro tables and its decorations need to give the diner the illusion that they are comfortable and spacious. Many cafe tables and restaurant will be used every day and will need to be cleaned after every use, we have a range of easy-clean table tops to choose from that can give your cafe a warm, homely feeling. Catering tables may be used more for banquets and buffets; these are more likely to be subject to spillages and hot plates so the tops are designed for this. When catering tables are not being used they may need to be stacked away as the room may be used for other activities so our tables are easily stacked. Bistro tables with a round shaped top are suitable for a family get together and small two seaters are better suited for a romantic couple or two people who want to have a quiet chat. Whichever tables are best for your business we are here at Cafe Reality to help and advise every step of the way.